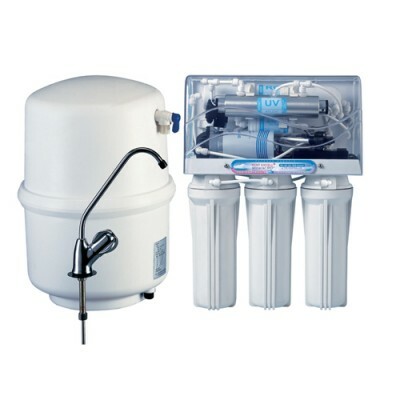 Home » Water Purifiers » Kent Excell Under-The-Counter / Kitchen Sink RO +UV+ UF Water Filter And Purifier. An under sink water filter and purifier enhanced with an inbuilt TDS Controller. · Fits under the sink or under the counter. · Saves kitchen counter space. · Separate High quality Stainless Steel Tank & Tap for purified water. · Fully automatic operation with auto-start and auto-off. · Equally suitable for water from all sources overhead storage tanks direct water taps etc. · Double Purification by RO & UV to remove bacteria,viruses,chemicals,pesticides,rust etc. · Computer Controlled Operation with Filter Change & UV Fail Alarm. · Stainless Steel Hydrostatic Tank to ensure fast flow of water. KENT Excell+ has a versatile design ideal for modern kitchens. 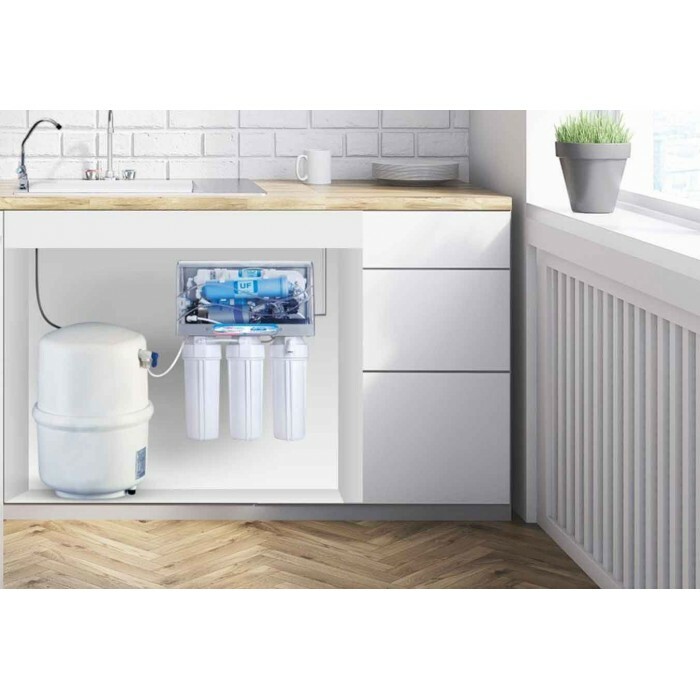 Its an under sink water filter sysytem , thereby saving expensive counter space. It is also suitable for attachment with water coolers and for refrigerators with water dispenser. 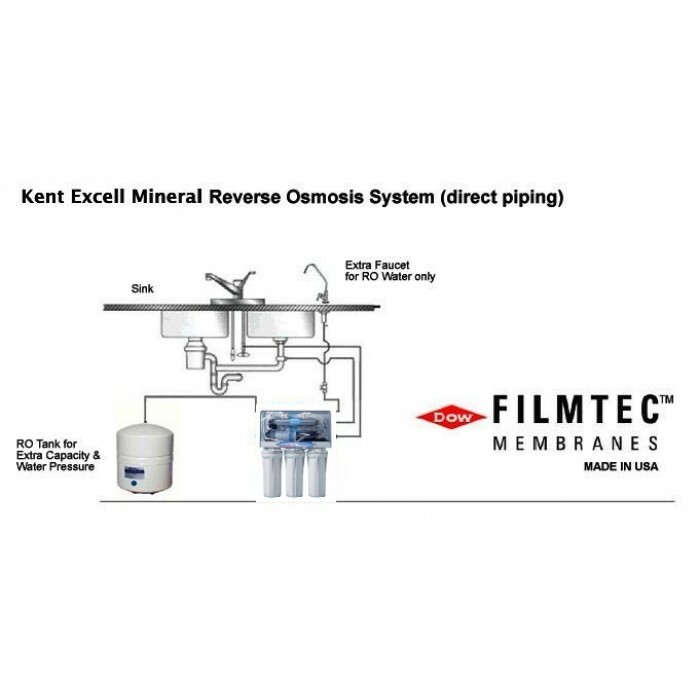 KENT’s patented KENT's Mineral ROTM technology provides double purification of RO + UV + UF, which removes even dissolved impurities such as chemicals and salts. The TDS controller maintains essential natural minerals, thereby providing 100% pure, safe & tasty drinking water, which is ideal for consumption. KENT Excell+ is tested and certified for its performance and quality by renowned laboratories of the world such as WQA and NSF in USA. WQA Gold Seal is one of the most recognized certification in the drinking water treatment industry and provides assurance that the products have been rigorously tested and comply with all the requirements of the testing standards. KENT Excell+ is also CE certified. KENT Excell+ purifies water from different sources such as bore-wells, overhead storage tanks, water tankers and even municipal taps. KENT Excell+ has 7 litres of purified water storage capacity with hydrostatic storage tank. The hydrostatic tank ensures pressurized supply of purified water even in the absence of electricity or running tap water. KENT Excell+ incorporates Filmtec RO membrane (A DOW Chemical Company product), the most trusted RO membrane brand in the world. The membrane has a long life and is less prone to fouling. It is highly efficient and effective for removal of bacteria, viruses and other dissolved impurities. Computer controlled operation has two unique features – Filter Change Alarm and UV Fail Alarm. Time based Filter Change Alarm notifies the user to change filters. UV Fail Alarm alerts the user when the UV lamp becomes inefficient. KENT Excell+ uses high-powered 11W UV lamp instead of the Industry standard 8W UV lamp, to provide complete de-activation of harmful micro-organisms. High-wattage ensures better safety against harmful micro-organisms like bacteria and viruses. KENT Excell+ incorporates a built-in rugged SMPS (Switching Mode power supply) instead of a standard power adaptor. It is equipped to handle a wide range of input AC voltage (100 – 300 Volts) which enables the purifier to stay resilient towards frequent power fluctuations. Non-breakable feature of ABS plastic ensures higher durability & longer life of the purifier. Food grade classification ensures that no harmful chemicals leech into purified water.Its also BPA free safe. This RO purifier is tested and certified for its performance and quality by world’s renowned laboratories, such as the WQA (USA), NSF (USA) and ISI. These achievements guarantee that KENT not only gives the most purified water but is also trusted by millions.